Chocolates have been around since 1100 B.C. when the Aztecs and other Mesoamerican people started making chocolate beverages. But ever since John Cadbury of Great Britain created an emulsification process to make solid chocolates in the 19th century, it has become one of the most favorite food items in the world. It is probably the only food item that kids can eat and finish without much prodding from the parents. Chocolates are delicious and healthy as well. They are known to release chemicals in the body that make a person feel better. Price should not be an object when it comes to this amazing delicacy. Here are the top 10 most expensive chocolates in the world. Each of these black truffles is filled with champagne before being decorated with gold leaf. The box also adds to the luxury of this product as it is uniquely designed using a total of 450 Swarovski crystals. Possibly the most expensive multi-pack of chocolate bars you could ever buy. However, these are a little better than you would expect from a pack picked up at the local store. This box contains eight small chocolate bars each coated in gold leaf. The chocolates, or ‘Golden Truffles’, are Swiss choclates made from grand Cru chocolate from Ecuador. This family-owned chocolate business led by Michel Cluizel has been creating chocolates since 1948. This box contains packages of 400 assorted chocolate treats, all of which are handmade. Customers also have the option to customize the box to suit their own personal preferences. Some of the chocolates on offer in this box have a cocoa percentage of as high as 99 percent. Debauve & Gallais, a French chocolate manufacturer, was established in 1800 by Sulpice Debauve. He was later joined by his nephew, Antoine Gallais. There are 12 coated chocolates in this box. Four of these are 22 carat gold, four are solid silver and the final four are adorned with sweet diamonds. The chocolates are made from the royal collection of cocoa gourmet. Devised by the well-known chocolate brand, Cadbury, the popular Wispa bar is wrapped in an edible gold wrapper. This is a move away from their usual products which are better known as being affordable yet tasty. Created by Fritz Knipschildt, these hand-crafted chocolates are made with the finest ingredients available. The packaging of the chocolates is equally well though out and entices chocolate lovers to spend this amount of money on a box of chocolates. The concept for this box of chocolates was a collaboration between Harrods and Patchi. The chocolates were created by a Lebanese chocolatier. Each of the 49 chocolates is carefully wrapped in hand-woven Indian silk and then placed in a suede casing. 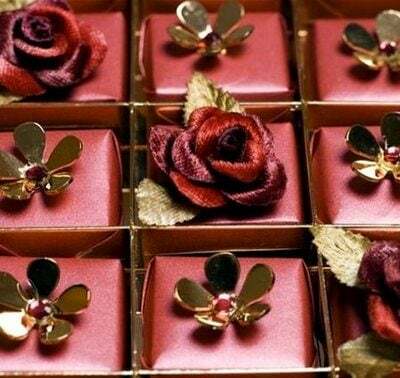 The chocolates are then enhanced further as they are adorned with silk roses, gold and Swarovski crystal. Chocolate eggs are a family favorite, especially around Easter. Although this masterpiece is accredited to William Curley, it actually took three days for seven chocolatiers to create this egg. It is dipped in Amadei chocolate from Venezuela and filled with a variety of luxurious chocolate delights. These include chocolates flavored with rosemary and olive oil, juniper berry and muscovado caramel. The exterior of the chocolate egg is a visual delight with carefully crafted decoration and extra chocolates. Not only does this chocolate box have a range of gourmet chocolates by Lake Forest Confection, it also contains jewelry by Simon Jewelers personal jewelry collection. On opening the box you will be delighted to see necklaces, rings, bracelets and earrings. The concept is based on the belief that the two things needed to seduce a woman are chocolate and diamonds. Perhaps the fact they are willing to pay $1.5 million for a seduction method is persuasion enough.